April is a fantastic month. Well, actually I think I could write twelve posts with the title “In praise of ...”, because each one has got its charme. But since I'm writing in April, I'm writing about April. The most obvious quality of April is the explosion of the blooming season, that has quietly started - at least here in the Mediterranean region and at low altitudes - since the end of January. Also the fact that the day is again quite long and - thanks to the daylight savings - the sun is in the sky up to dinner time, allowing us to enjoy an en plein air journey all the day long. But a specific feature of April is that, in spite of the full blossoming, many species of trees still expose naked branches. This is important for some kinds of architectural shots, where the building is located in a wood, because the foliage would easily hide the subject; or create deep shadow with excessive contrast in a sunny day. Sure, you enjoy naked branches since late fall and all the winter around; but the mood is completely different. Sony NEX-6 + Sony E 10-18mm F4 OSS @ 10 mm, 1/400 sec @ ƒ/5.6, ISO 100, hand-held, four frames stitched together. 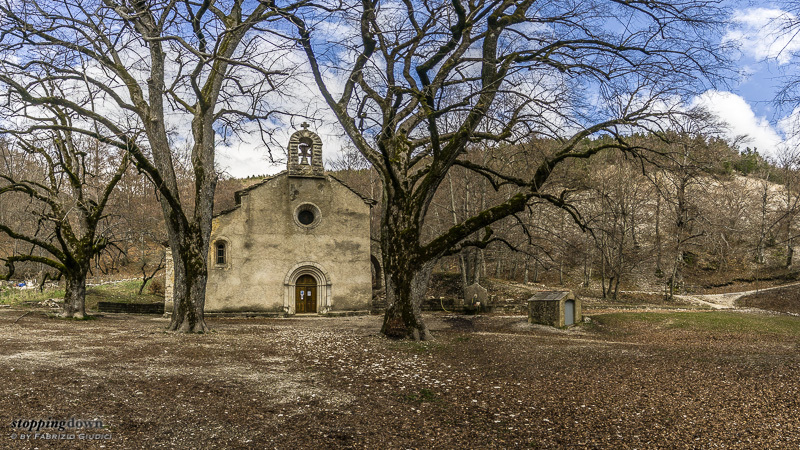 The abbey of Notre-Dame de Lure is a lovely small church (the only survivor of a larger building) located on the Montagne de Lure, “la petite sœur du Mont Ventoux”. I've been there twice and I had been immediately fascinated by this church, that you unexpectedly find at 1.200 metres after a small detour of the road that climbs up to the summit of the mountain, when you think that all the traces of human-made structures have been left behind you. In the past I wasn't able to find a good way to take a photo of it. First, for environmental causes: for instance too many people around, too much foliage (which also creates harsh lighting conditions in a sunny day). And also because the scenario requires an ultra-wide lens. I even tried a fish-eye lens, but the presence of straight lines poses a lot of constraints (you must keep the church near to the centre and keep it close, so distortion is reduced). Today I've instead used a rectilinear ultra-wide (10mm) and stitched four vertical frames together. 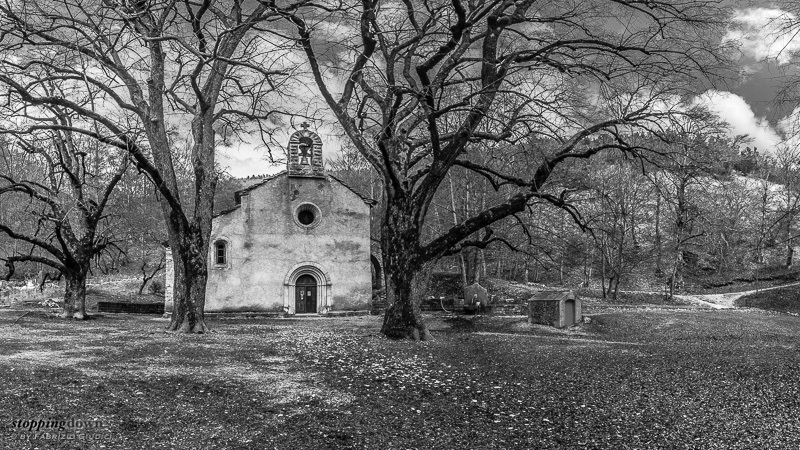 The black and white version is my preferred one, because it stresses the contrast between the natural shapes of the trees and the human-made shape of the church. But even the colour version is not bad at all. Hard subjects are the most satisfying ones: there's a special pleasure when, at last, you get a good photo after many failed attempts. But I'm not finished with this lovely church: it's the kind of subject that you have to portray in multiple seasons. I can only imagine the rich colours with fall foliage, and the clean simplicity of this delightful corner covered with snow.